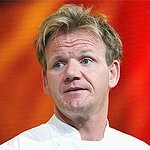 It was a humbling experience for celebrity chef Gordon Ramsay when he met brave children suffering from spina bifida. Known for raising hell in the kitchen, the volcanic star showed a more angelic side as he and his wife Tana played with children during a visit to a charity centre in Scotland. Ramsay vows to work with the Scottish Spina Bifida Association for the rest of his life. Ramsay has been a part of the charity for four years now and finds it to be an incredible experience. He was also happy his wife could behold the children’s zeal on this trip. Among the children Ramsay spent time with on his visit were twins, Chloe and Jade. Chloe does not have the condition but her sister Jade is paralyzed from the waist down. The condition doesn’t stop Jade; instead, she has pressed on by continuing to practice Taekwondo to the extent of earning a yellow belt, and she also plays the violin. The twins’ parents are grateful to Chef Ramsay. Likewise, he is committed to raising funds for the charity. Ramsay wants to encourage others to get involved by calling the Scottish Spina Bifida Association on 01236 794 505 to make a donation.